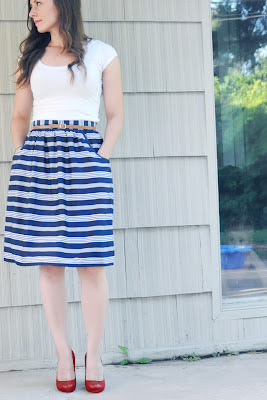 Very Homemade: Gathered Skirt with Waistband, Exposed Zipper, and Pockets; Oh My! This is my official go to summer skirt this season. I love the simple high waistband coupled with the curved opening pockets and a partially exposed brass zipper. I just love it. Pair it with a tee and some flats for the day or some pumps and a fitted blouse for a dressier ensemble. Either way, you can't go wrong. See my little lovie peeking out the window on the right? Exposed zipper.. here we come! Click below to see the full tutorial. First things first, let's cut out your skirt pieces. You will cut out a front panel piece and a back panel piece from both your main fabric and your lining as well as a waistband piece. Both the front and back panel of your skirt will start out as a rectangle. Measure your waist at it's smallest point. You will use this waist measurement as the width of each skirt panel. So, let's say that your waist is 30 inches. Your front panel piece will be 30 inches wide and your back panel piece will be 30 inches wide. For the length of your skirt panels, decide how long you want your skirt to be and add three inches to that. Cut out two rectangles using the dimensions above from both the main fabric and the lining fabric. You should now have four rectangles that are the same size, two rectangles cut from the main fabric and two rectangles cut from the lining fabric. For the length of the waistband, take your waist measurement and add 2 inches to that. So if I had a 30 inch waist, my waistband length would be 32 inches. For a clean, no fraying finish, serge, zig zag, or overlock down the length of all four of your skirt panels. Curved Pocket This is how I sewed the pocket pictured above. 1. With right sides together, pin the front skirt panel and the back skirt panel together. Sew the two side seams together. Do this for both your main fabric and your lining fabric. 2. Now, get your waistband and iron on the interfacing according to package directions. With the wrong side of your waistband facing up, fold the long side of your waistband down 1/2 an inch. Fold the waistband half lengthwise. 3. Next, time to gather both your main fabric skirt piece and lining skirt piece. 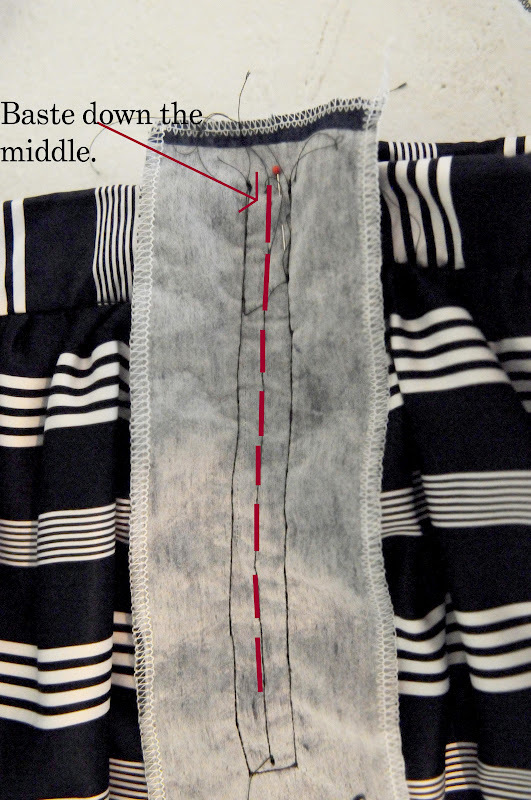 To gather, set your sewing machine to the longest stitch possible. Get your main fabric skirt piece. 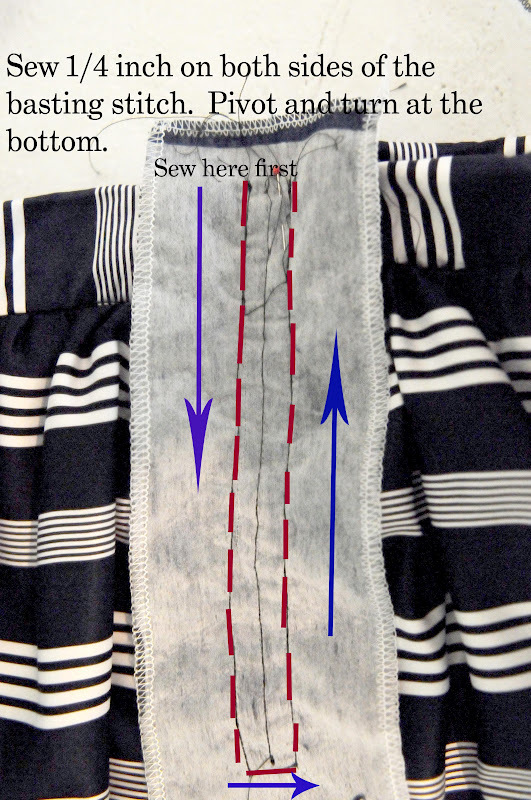 Sew two lines along the top of your skirt. For the first line, sew along the top of your skirt piece using a 1/4 inch seam allowance. Now sew the second line along the top of your skirt using 1/2 inch seam allowance. Gather your main skirt to match your waist measurement by gently pulling both thread lines gently. Repeat for your lining fabric. 4. Time to pin your skirt and lining to your waistband. Unfold the one folded edge of your waistband. You should be able to clearly see the pressing lines from that folded edge. This will be your sewing guide later. Turn your main fabric skirt piece inside out. Find the middle point of the back of that skirt piece. Mark that spot with a pin or a fabric marker. 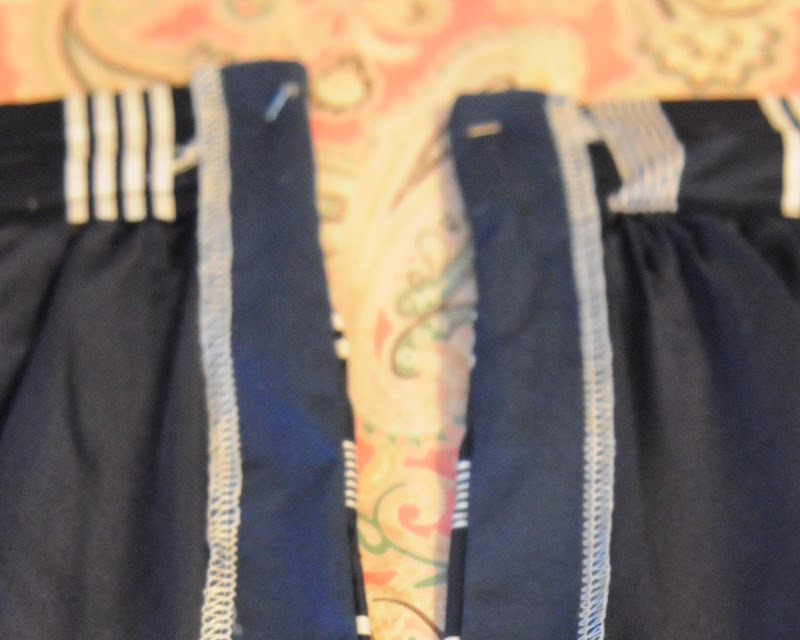 When you pin the waistband to the skirt, you will want the waistband to have a 1/2 inch overlap at the mid point of the back of the skirt (this will be where the zipper goes). With right sides together, start pinning the waist band 1/2 inch before the middle point of your skirt. Be sure all raw edges are lined up (My waist band did not line up so just pretend all the raw edges lined up perfectly in the photo below ; ) ). The waistband should end 1/2 inch past the mid point of the back of the skirt. Turn your lining skirt piece inside out. With your main fabric skirt piece still turned inside out, pin the lining skirt piece to the waistband and the main fabric piece just as you did before . Line up the side seams of the main fabric and the lining. 5. Now let's sew that waistband on. Turn your skirt right side out (the wrong side of the waistband should be facing up) and sew along the 1/2 inch fold line on your waistband. Here's a quick tip to keep from having wonky gathers, every now and then gently smooth the skirt pieces down as you sew to make sure they are being sewn in straight. 6. Now fold your waistband over towards the inside of the skirt. From the right side of the skirt, stitch in the ditch. 7. Cut a piece of coordinating tightly woven fabric (I used a navy Cotton-poly blend I had on hand) 3 inches wide and 3 inches longer then your zipper (this will be called stay fabric from now on). Add interfacing to the stay fabric. 8. 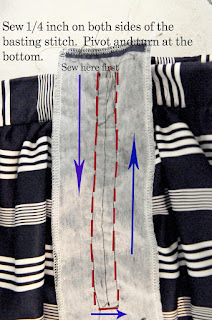 Serge, overlock, or zig zag stitch around all four sides of the stay fabric. 10. Next, draw a line down the middle of your stay fabric to just below where the zipper's bottom stop will be. 11. Now you will pin the stay fabric onto your skirt. You will need to place your stay fabric so that it starts 1/2 an inch above the top of your skirt. With right sides together (interfacing should be facing up), pin the stay fabric onto the skirt. Be sure to pin this stay fabric on straight. You don't want the zipper to be crooked or slanted! 12. Baste down the middle line of your stay fabric. 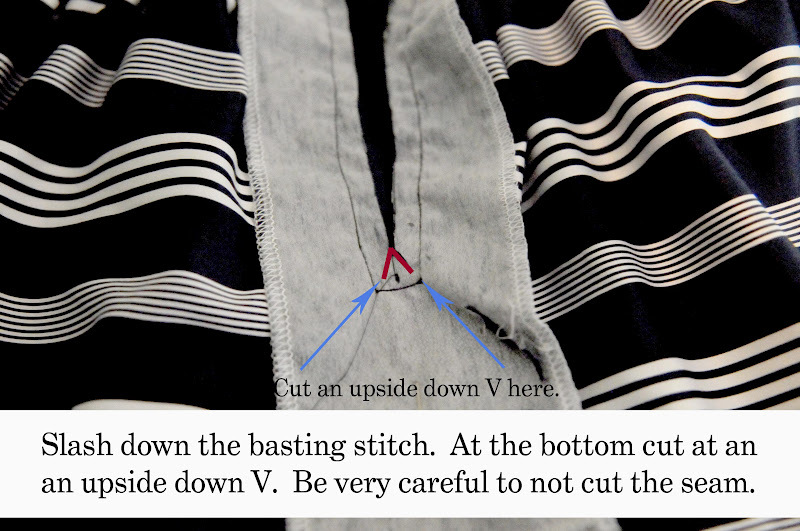 Be sure to stop sewing where you marked the bottom stop of your zipper. 13. Change your stitch length so that you are no longer using a basting stitch. Starting at the top of your skirt, sew a line 1/4 of an inch away from the middle line of your stay fabric. When you reach the end of the line, keep your needle down and pivot the fabric; sew across the bottom line, pivot and turn and sew up to the top of the skirt keeping the seam consistently 1/4 of an inch from the middle line. 14. Carefully slash down the basting stitch. 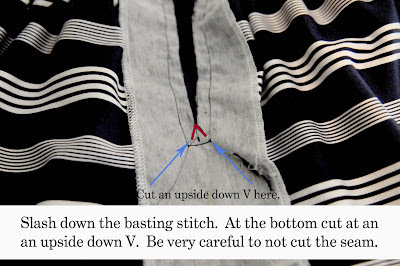 1/4 of an inch before the bottom of the basting stitch, cut a very small upside down V. Be careful not to cut any seams. 15. Flip the stay fabric to the inside of your skirt. Fold down the extra 1/2 inch of stay fabric at the top of your skirt so that the ends are hidden. Press and pin in place. See the (blurry) photo below. Press the entire opening flat. 16. Turn your skirt right side out again. With your zipper zipped up, place the zipper in the opening of your skirt. Pin the zipper in place at the top and the bottom. You will do the bulk of the pinning from the inside. 17. Turn your skirt inside out. Carefully pin the zipper to the stay fabric only. This will give you a clean finish with no visible seams around the zipper. I used quite a few pins to make sure the zipper would be sewn on straight. You could also use fusible web or iron on hem tape to keep the zipper in place before you sew. 18. Time to sew the zipper on. You will sew the zipper on just to the stay fabric; again this will give you a clean finish without any visible seams around the zipper. Using a zipper foot, sew about 1/8 of an inch away from the zipper. Sew down one side, then across the bottom, and then up the other. Pivot the foot with the needle down as you turn. Keep the bulk of the skirt away from your stay fabric as you sew so you don't accidentally sew your skirt fabric into the zipper. Also, be careful not to sew the metal teeth. And that's it. You're done! Here's the zipper from the inside (prior to ironing or clean up). Now go try that pretty little thing on! What a pretty skirt,who wouldn't love it! Great skirt! I love the exposed zipper and striped fabric. Amber, this is awesome. I think I will be able to do this. Now, do you also have an easy top pattern? I have a print that I want to make a skirt out of, and a solid to match for the top. Any suggestions? LOVE IT!!!!!!!!! Please make one for me... PLEASE?!?! LOVE the fabric too!! 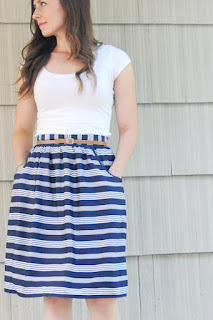 This skirt looks fantastic on you! I love the pockets and the exposed zipper. So chic! "To get the width measurement of the front and back panel of your skirt, measure your waist at it's smallest point. Double that measurement (or if you want your skirt to be less full, multiply your waist measurement by 1.5)." is this the total width or is this the width for each panel? Thanks for asking. You helped me to catch a mistake (which I just corrected, thanks to you!). You will use your waist measurement as the width of each panel. So, let's say your waist is 30 inches. Your front panel piece will be 30 inches wide and your back panel piece will be 30 inches wide. If you want to have a skirt that is less full, divide your waist measurement in half and then multiply by 1.5. So a 30 inch waist will give you two 22.5 inch panels. So have you already pinned your main fabric to your waistband? You will pin the lining onto the waistband (and the main fabric) in the same way you pin the main skirt piece to the waistband. Turn your lining inside out. Line the raw edges of your lining with the raw edges of your main fabric piece and the waistband. Pin the lining onto both the main fabric piece and the waistband. So you will have three layers to sew through when you sew the waistband on. Does that clear things up for you? If not, let me know!